Thanks Phil, in order to answer your question, I have to start by going one step back and outline where the industry is, as there is little reference material from analysts and third-party advisors. The notion of independent testing is evolving where services are not just bundled as part of an IT outsourcing contract but are delivered as a stand-alone offering. But, broadly speaking, testing services lag most IT service lines in terms of mindshare and broader visibility. A lack of investment, immaturity of organizational models, a highly fragmented supply-side, and inadequate marketing top the list of reasons behind this. Or, to put it in simpler terms, it is rare to see testing as part of broader sourcing discussions or conversations on how testing is helping organizations on their journey into the As-a-Service Economy. But things are starting to change and the maturation is tangible. Increasingly, we see standalone testing outsourcing deals in the hundreds of millions of dollars. Organizational models are evolving with mature approaches, often blending centralized and decentralized concepts. Furthermore, the leading providers are progressively embedding testing into the delivery of business processes, in the process moving up the value chain beyond a narrow focus on tools and technology. And lastly, capabilities around cognitive computing and artificial intelligence are being built out and are increasingly underpinning mature approaches to test automation However, what is still woefully inadequate is the marketing around testing services. In order to get a seat at the table for the big IT decisions, the testing community has to move beyond an emphasis on tools and technologies by building out narratives that resonate with process owners, namely around business case, transfer of assets and people as well as mitigating risks. You're considered a real guru in automation these days. Surely, automation is having a huge impact on the app testing space? Or is this simply driving up the quality of the labor component? What's your view and experience here? As I tried to explain in my introductory remarks, testing is at a different maturity level than most IT disciplines. So automation is largely discussed as a means to get to higher levels of industrialization by augmenting labor. But it's not included as much as a means to replace FTEs – as we have seen for instance in the discussions around RPA. Fundamentally, we haven’t had a discussion on disruption in the testing community as yet – and it would be a difficult one because most professionals chose testing as a career and it wouldn’t be easy to retrain or rebadge them. However, it is striking that there are some strong innovations in test automation that haven’t been leveraged in the broader market. The testing community should be more vociferous about its achievements. Furthermore, leading providers should demonstrate the increasing maturity with capabilities around cognitive computing and artificial intelligence – all with a view to move toward more predictive models. However, the flip side of this argument is that you can’t confine automation to testing. It needs to be part of a holistic approach to delivering services. And the acceleration of the journey into the As-a-Service Economy will exacerbate these issues significantly. How are the winning service providers approaching app testing services today? What are they doing beyond the bread-and-butter basic operational services? To differentiate your offerings is, by no means, easy. Much of the technology is based on standardized third-party tools. 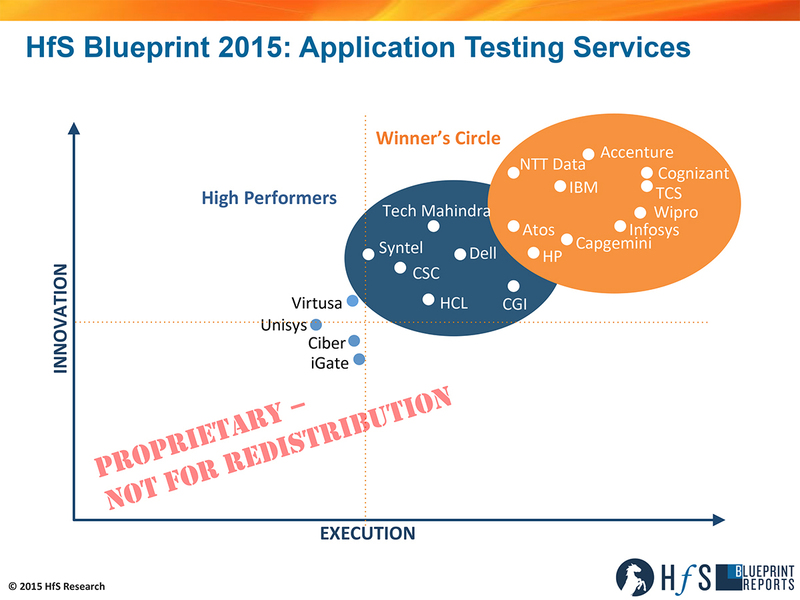 But the providers we have positioned in the Winners Circle stood out in a crowded marketplace for different reasons. Starting with some highlights in the context of execution: For TCS, testing is a standalone business unit and testing is a door opener for new logos. At the same time, Cognizant is the leading provider for comprehensive outsourcing with strong traction in the banking sector. IBM demonstrated solid traction in complex global deals, including its strong capabilities in the Japanese market. Finally, Capgemini deserves credit for educating the market on comprehensive outsourcing. Looking more closely at innovations, Accenture added a strong narrative on evolving toward predictive testing, underpinned by expansive analytics capabilities, plus the provider has built out strong industrialized vertical capabilities. NTT Data stood out through its innovations around mobile testing. In addition, Wipro embedded testing automation within its overall approach to automation, leveraging tools such as Fixomatic to provide predictive analytics and cognitive systems. These are just some examples and I could have added more providers with similar approaches. 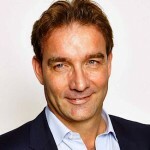 But the common denominator of the companies in the Winners Circle is that they stand out due to their vision to increasingly embed testing into business processes and encourage its evolution into a much more strategic proposition. Many of the Indian-heritage service providers built their businesses over the years from app testing support for major Western enterprises. Is this still the case for many? Isn't it still a major component of their revenue base? There are various ways of looking at it, Phil. Fundamentally, testing services are high-margin business. As such, they have a high strategic importance for every provider. Suffice it to say the leading Indian-heritage providers are constantly evolving and building out capabilities across the board, including consulting, infrastructure, BPO – you name it. This way they have much more balanced portfolios and can move up the value chain to become strategic providers for their clients. On the other hand, the market for testing services is highly fragmented. There are still many pure plays with a focus on specialist services or specific verticals. So consolidation is unavoidable, as IT services are all about global reach and scale. With the maturity of global labor delivery at scale, and with these advances in intelligent automation and cognitive computing, how to you see the app testing market unfolding in the next 2-3 years? Is the advent of digital, mobile, RPA, and so forth, driving the need for more testing? Good question – but not easy to answer briefly. My gut feel tells me that the leading providers will accelerate building out more business-centric approaches. As a result, they'll provide a much stronger demarcation to the many pure plays. The reference points here are embedding testing into business processes, embracing comprehensive outsourcing and supporting clients in their journey into the As-a-Service Economy. While the direction of travel is easy to depict, the road ahead will be a bumpy one. For instance, how can providers ring-fence their high margins in view of the rise of Intelligent Automation? Flipping it to the more positive side, the testing community should provide a much more proactive approach in guiding clients on how to test innovative products and offerings that can be As-a-Service propositions. Take RPA and Autonomics as an example: Testing these highly industrialized offerings is paramount, but I have yet to hear how the testing community will rise to this challenge or grab the opportunity. Similarly, in the context of “digital transformation,” the community should switch from reactively stating that it supports mobility, cloud, social and analytics to outlining how it will support business transformation. Much of this is about cultural change. And we are looking forward to engage with the community around exactly these challenges. HfS readers can click here to view highlights of all our 22 HfS Blueprint reports. Cheers Surya. You are spot on that in the context of Shared Services and comprehensive outsourcing agile methodologies need to be adapted. It is easy to point to “agile” as a reference point for innovation in testing. But it is a complex issue to depict the implications for the various organizational models around testing. The more testing is moving up the value chain toward notions of mature Shared Services and broad outsourcing, the more the supply side has to address these issues. These are exactly the questions I keep asking the vendor community and the answers vary greatly. As such you might forgive me for not just name dropping “agile” in this summary. But I couldn’t agree more that we need to broaden the discussion on the sourcing implications around testing.